25/03/2019 - Civil works nearing completion, macrophyte planting commencing soon. 15/2/2019 – Concrete structures nearing completion and soft landscaping commenced. 14/12/2018 - Recent storm events caused some damage and repairs are underway. 7/11/2018 – Earthworks are nearing completion. 1/8/2018 - Fences are now up around this site and construction will start soon. 21/6/2018 - Letters advising of the start of construction are being delivered to residents who live within a 100m radius of the site. Please check your letterbox. You can also view the letter here. 17/7/2018 - Site fences will go up next week. 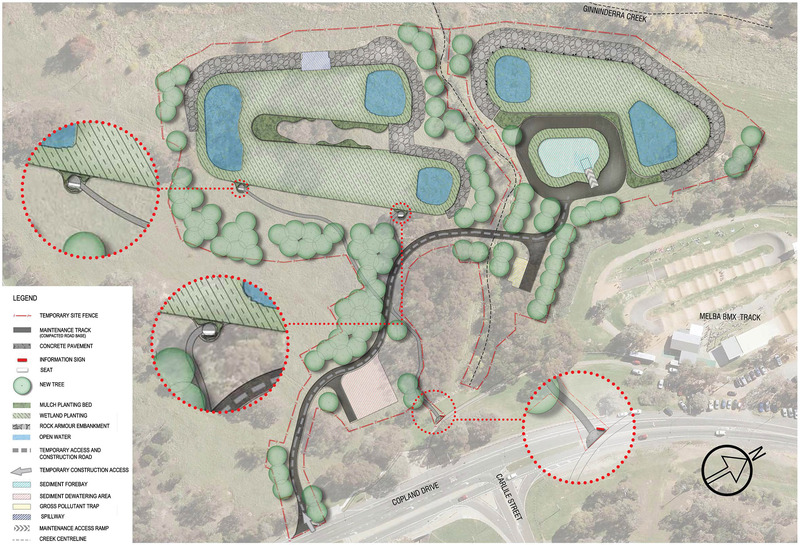 Two new wetlands beside the Canberra BMX Club in will filter urban stormwater before it flows into Ginninderra Creek, replacing a largely unused space with an asset for local residents to enjoy. The project is one of three water quality infrastructure projects being built downstream of Lake Ginninderra. Another two wetlands near Croke Place in McKellar and the revegetation of a stormwater drain in Florey complete the set. The linked wetlands in Melba also include a sediment pond and an open gross pollutant trap. 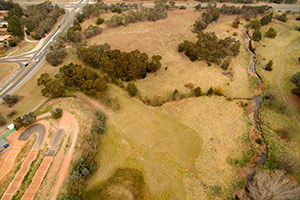 They have a combined surface area of about 9,200 square metres and are designed to remove over 26,000 kilograms of nitrogen, phosphorous and suspended sediment every year from urban stormwater destined from the Ginninderra Creek. Rock armaments will protect the wetlands from periodic flooding. Although a number of trees will need to be removed to make way for the wetlands, extensive re-planting will be undertaken. Armaments were added to protect the wetlands from localised flooding. An encircling pathway was removed for public safety and operational reasons that relate to the flood risk. Collection and distribution pipes were reconfigured to reduce the impact on the existing waterway. The GPT was moved to an offline position. A diversion weir was replaced by a culvert crossing for the access track. The two access tracks proposed for community consultation has been replaced by a single track to minimise disturbance of the grass area and trees.